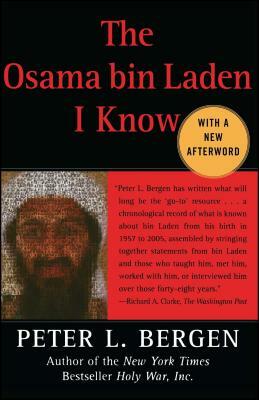 No one knows more about Osama bin Laden than Peter Bergen. In 1997, well before the West suddenly became aware of the world's most sought-after terrorist, Bergen met with him and has followed his activities ever since. Today, years after President Bush swore to get him dead or alive and despite haunting the popular imagination since September 11, 2001, bin Laden remains shrouded in mystery and obscured by a barrage of facts, details and myths. With numerous never-before-published interviews, The Osama Bin Laden I Know provides unprecedented insight into bin Laden's life and character drawing on the experiences of his most intimate acquaintances. This timely and important work gives readers their first true, enduring look at the man who has declared the West his greatest enemy. Peter Bergen is the author of Holy War, Inc. and The Osama Bin Laden I Know, both named among the best nonfiction books of the year by The Washington Post. He is a contributing editor at The New Republic and has worked as a correspondent for National Geographic television, Discovery, and CNN. His writing has appeared in the New York Times, Washington Post, Wall Street Journal, Foreign Affairs, Atlantic, Rolling Stone, Time, Vanity Fair, among other publications.